Hong Kong-listed Huarong Energy, formerly Rongsheng Heavy Industries, has announced that it plans to issue 17.1bn new shares to creditors at HK$1.2 ($0.15) per share. Creditor banks and suppliers of the company will acquire 14.1bn shares and 3bn shares respectively. 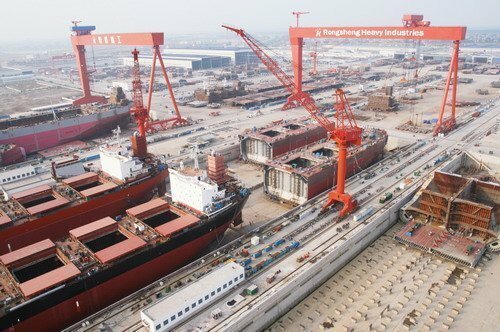 The company said the new share issue is to adjust and optimize the business and to dispose the relevant liabilities of the group in light of the depressed shipbuilding market. So far, 12 of 22 bank creditors and suppliers creditors holding RMB323m ($49.6m) debts, have entered into letters of intent with Huarong Energy to subscribe to the shares. After the completion of the new share issue, group founder Zhang Zhirong’s share will be diluted from 18.9% to 2.1%, and three creditor banks will become the major shareholders of the group. However Huarong Engery said the control of the company will remain unchanged. Huarong Engery has been making efforts to deal with financial crisis since 2014, it suffered losses of RMB8.68bn, RMB7.75bn and RMB2.03bn in 2013, 2014 and the first half of 2015.